The unthinkable has happened – a tornado touched down in the center of Austin at the height of SXSW. The epicenter is at the Austin Convention Center, which has been reduced to rubble. You have a flock of frightened conventioneers who don’t know the city, aren’t sure who to listen to or where they should go, and there could be possible casualties, even fatalities. What do you do? After experiencing this panel, Disaster: The Future of Crisis Communications, I am of the mind that more panels should begin with a mock disaster like the one above. It got everyone’s attention (did they just say there’s a tornado downtown? ), and it was a great way to get the panelists and audience working together to develop a solution to a situation that could (and does) happen in real life. This being my first time at South by Southwest, I’ll admit that I went into our Day One sessions with high expectations, and I’m happy to say that this panel was a bright bunch and didn’t disappoint. The moderator, Hanson Hosein, Director of Communication Leadership at the University of Washington, started us off by sharing some stories about his travel overseas as an NBC News war correspondent. 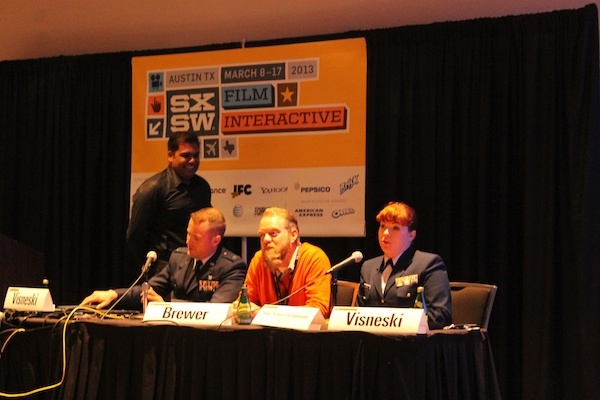 While he was busy regaling us with several of the tricky situations in which he’s found himself, LT Anastacia Visneski, a Public Affairs Officer in the U.S. Coast Guard, was busy setting up a JIC (Joint Information Center) to handle the SXSW tornado crisis. She set up a @SXCrisis Twitter handle (and had already begun tweeting resources), a Facebook page, and had the crisis been real, would have also begun assembling the crisis team members. Captain John Visneski, a cyberspace control officer in the Air Force joined in the conversation at this point, as did Brandon Brewer, an independent communications consultant and retired military public information officer. Don’t wait until you are in a crisis situation to develop your crisis communications plan or team. You need to know ahead of time where you audience is, what resources you may have available to you, and how well your team works together prior to a high-stress situation. Once crisis hits, it’s imperative that you get everyone together to coordinate messaging so that it comes from a single source as one voice. When choosing who shares the message of your organization, brand or agency during a crisis, don’t be afraid to think outside your organization as well – there may be a community influencer, blogger or journalist that can help you facilitate messaging more quickly. If you’re unsure of what the extent of the damage will be, put out information on what the worst case scenario could be and how you plan to respond. Don’t sugarcoat it. If the situation is due to a mistake on behalf of your organization, the best thing you can do is be honest (and apologetic). Man up! If things go from bad to worse, and someone tries to hijack your messaging (think @BPGlobalPR), don’t feed the trolls. Get your story out, and try not to worry about the other guy; however, if they do get traction, see if there’s a way you can work together to get important messaging out to the people who need it. Create strong bonds with your crisis communications team BEFORE crisis hits, and you’re sleep deprived, hungry and mad at each other. Foster a relationship of trust with your superiors so that if you need to change tactics quickly, you can do so with minimal delay. Crisis communications tools vary depending on the circumstances – you could be using a varied mix in order to extend the reach of your megaphone, but at the end of the day, while digital channels are effective at getting the word out, they enhance rather than replace traditional channels. If you already have a crisis communications plan, don’t rest on your laurels – be up on the tech and potential resources, making changes to the plan when necessary.